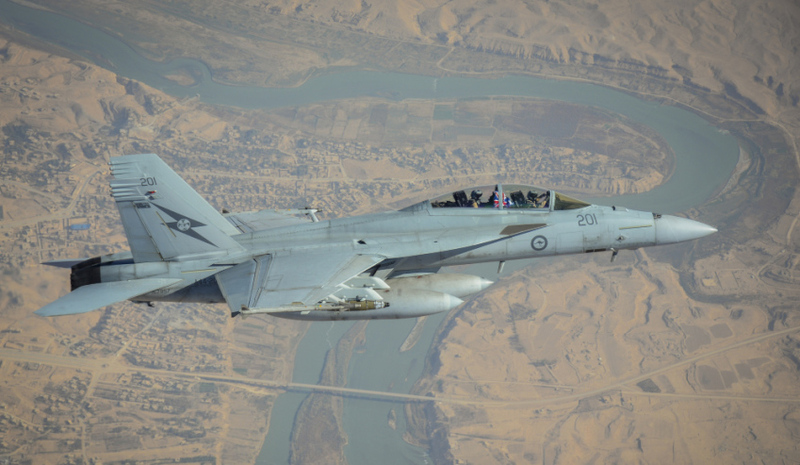 An RAAF F/A-18F Super Hornet manoeuvres over Rawah, Iraq, during an Operation OKRA sortie. Image via Commonwealth of Australia, Department of Defence. Australia’s six F/A-18F Super Hornets will return to Australia in January, marking the end of Australia’s air strike operations in Iraq and Syria. Minister for Defence Marise Payne confirmed that, following a review of Australia's contribution to Iraq after its liberation from Daesh earlier this month, Operation OKRA has now reached a "natural transition point". "The battlefield success against Daesh means our own Operation OKRA has now reached a natural transition point and our strike aircraft will begin returning home early in the new year," Minister Payne said. "Since October 2014, our Hornet pilots and support personnel have made a significant contribution in support of the Iraqi Security Forces and I commend all the ADF personnel who have contributed over this period for their dedication, skill and professionalism. "Australia’s Air Task Group has made a valued contribution to coalition operations against Daesh that is highly regarded by the US, Iraq and coalition partners." Australia’s E-7A Wedgetail and KC-30A refuelling aircraft will continue to support counter-Daesh coalition operations. Australia will also continue its training mission, which involves around 300 Australian and New Zealand personnel at Task Group Taji and around 80 personnel in a Special Operations Task Group. "Australia is committed to supporting the Iraqi Security Forces as it clears the remaining pockets of Daesh fighters in rural areas and ensuring the long-term stability of Iraq," Minister Payne said. The Royal Australia Air Force (RAAF) contingent fell under Operation OKRA, which commenced in 2014 and extended into Syria in 2015. The Department of Defence said of the 2,700 sorties against Daesh, 702 occurred in 2017.